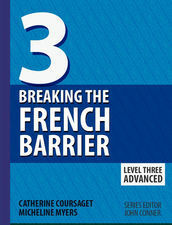 Breaking the French Barrier is part of the acclaimed language series that engages students of all levels, giving them all the tools needed to find success on the path to fluency. First published in 1997, this series is now used throughout the country and world in high schools, colleges, and middle schools as well as by homeschool families and adult learners. Building upon the foundation established in Level I (Beginner) and Level II (Intermediate), Level III (Advanced) begins with a review of the present, past, imperfect, conditional, future and perfect tenses. Among topics covered in detail are the subjunctive mood along with the passive voice, “if clauses,” punctuation, pronouns, and uses of the infinitive. This level provides a wonderful review of the key grammar found on AP, SAT II, IB and college placement tests. Hundreds of exercises reinforce the amazing explanations offered by some of the country’s leading language teachers. This text fully equips students for a lifetime of pleasurable and authentic contact with the Francophone world. In addition, this ebook offers cultural articles (e.g., Le hockey à Montreal, La cuisine sénégalaise, Roland Garros, Le rap francaise) complete with audio, video and comprehension questions. Vocabulary, grammar and cultural information are presented in this new Breaking the Barrier ebook in a way that can only be called revolutionary. Combining the brilliant instructional features of the Shelfit E-Reader with the winning approach developed by acclaimed teacher John Conner, Dean of Faculty at Groton School and former member of the AP Test Development Committee, this groundbreaking version of the series is just what any language learner needs to excel.